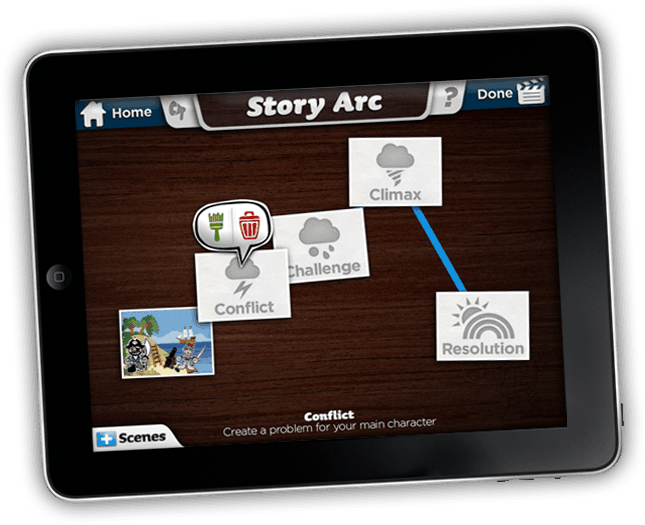 To analyze a conflict at school using a story arc (via Toontastic) to describe that conflict. An iPad per pair/trio of learners with Toomtastic downloaded and installed on each iPad. Learners are directed to compose Toontastic cartoons/stories about conflicts that happened on the playground or anywhere at school. They need to follow the story arc provided in the app, (pictured below) using the stages and music to enhance their narration of the story. They are to work in pairs and trios to devise their stories: choosing the scene, main characters, setup, conflict, challenge, resolution and music.